Massimo Polidoro described a certain someone as “a precious jewel” of a person, whose company and insights were sought by the wisest of leaders. This person “swam upstream,” eschewing fads and seeking to discover the truths and communicate those truths to others. This incredible human being exemplifies the term Renaissance person. 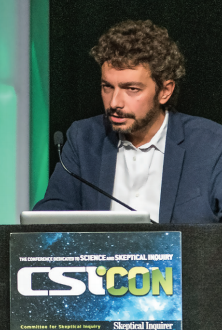 Polidoro was talking about Leonardo da Vinci (about whom he is writing a biography), but he could easily have been talking about two of the speakers in the Saturday afternoon presentations at CSICon 2018. First there is the educational powerhouse Bertha Vasquez, whose secret identity is that of a mild-mannered middle school science teacher but whose superhero persona is that of the director of CFI’s Teacher Institute for Evolutionary Science (TIES).